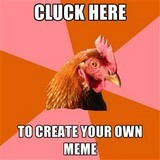 Add your own Chicken Joke! While we strive to be the largest and most complete chicken joke site on the Internet, we know there are more jokes out there to be found! If you know of a chicken joke that we don't have listed on our site, please share it with us below to be included on WhyDidTheChickenCrossTheRoad.com!